White snakeroot, scientific name Ageratina altissima, is a perennial wildflower with a wide range across eastern North America. The plant is highly adaptable, and is able to thrive in a wide range of conditions, including where few other flowers will grow. In some areas, it is commonly perceived as a weed, which is ironic because in the same regions, it can be found for sale in nurseries. If you learn to identify this plant when it is not blooming, you can spare it when weeding. White snakeroot has opposite leaves which tend to be flat at the base, have regularly serrated edges, and come to a point. The plant tends to have an orderly, symmetric form, often branching and forming a relatively thick shape, but its leaves frequently show evidence of insect damage, both trails from leaf borers, and chunks taken out of the leaf by larger insects. It grows to 3 feet tall under ideal conditions, but is often shorter. The flowers are white, in small clusters near the end of each stem. A given plant will typically branch, and bloom in several clusters. Flowers appear in late summer to fall, with a few plants occasionally starting to bloom mid-summer. The flowers are followed by seedheads with wind-dispersed seeds. This plant looks similar to plants of the Eupatorium genus, which go by the common name of "Boneset". White snakeroot used to be placed in this genus. These plants are still close relatives, but are now classified in a separate genus. Another close relative is the blue mist flower, Conoclinium coelestinum, which looks similar but blooms blue, and is slightly harder to grow, needing more consistent moisture. Take a close look at the foliage of this plant, so you can learn to identify it when it is not in bloom. Prefers partial sun to light shade, but can tolerate sunnier or shadier spots. Tolerates a wide range of soils, and often thrives in disturbed areas and urban areas. Ageratina altissima is one of the most adaptable plants. Its ideal growing conditions are partial sun or light shade, average moisture levels, and loam or clay-loam soil, but the plant is able to grow in full sun or even fairly dense shade, and can also adapt to poor soils and disturbed, urban habitats, and both wet or dry conditions. If you're having trouble growing wildflowers in your yard, white snakeroot is a great one to try. It's also a great plant to grow if you have a "black thumb". Not only is this plant relatively unkillable, but its broad range of suitable growing conditions makes it ideal for gardeners less experienced with recognizing different habitations and growing conditions. Poisonous to humans; the toxins can also be passed through cow's milk. 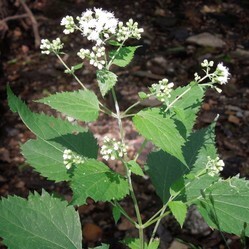 White snakeroot, like many wildflowers, is poisonous to humans. It is not, however, as poisonous to cattle, and cows will sometimes eat it, which can be dangerous, because the plant's poison can be passed into their milk, making their milk poisonous to humans. I have seen sources attributing the death of Abraham Lincoln's mother to such a case of milk sickness, possibly caused by this plant. Usually though, cows will not eat this plant unless a pasture has been heavily over-grazed. The poisonous foliage of this plant actually makes it a great choice for most suburban areas where there is a problem with deer and rabbits eating wildflowers. Both deer and rabbits tend to completely ignore this plant! I've even found it an effective way to deter rabbits from eating plants...if you plant a bunch of these, you can then plant more tasty plants in the middle of the patch and usually the rabbits will be deterred by the border of inedible plants. Although I recommend planting the straight species, not a cultivar, it is good to know that this cultivar is available so you can recognize it if you see it. White snakeroot has a common purple-leafed cultivar. It is sometimes sold under the name Chocolate snakeroot, and also frequently sold as Eupatorium rugosum 'Chocolate'; Eupatorium rugosum is an old scientific name for the species, before it was reclassified in a separate genus from its close relatives in the Eupatorium genus. Pictured here are two seedlings of the chocolate snakeroot cultivar pictured above, which sprouted in neighboring flower beds. One has reverted to a green-leafed variety, which seems to be growing more vigorously, as it is the plant's natural state. Erigeron annuus, annual fleabane or Eastern daisy fleabane, a beautiful annual daisly-like flower: growing requirements and cultivation tips. Are you a science teacher? Well done. Very interesting and informative. I've become hugely fond of this plant. There are some severely degraded woods behind my current apartment, and it's one of the few native plants that was growing there, holding its own against the numerous invasive plants. I also have found it great for attracting wildlife. It is ignored by deer and rabbits, which makes it great for overgrazed areas, but it is eaten by numerous insects, which are in turn eaten by birds, and the seeds are also eaten by birds. Even a single plant creates a whole ecosystem! I was thinking of adding more to this page on it because I've learned more about its relationships to animals, during the time since I wrote this article. Here you can familiarize yourself with the varieties of hydrangeas available to beautify your landscape.